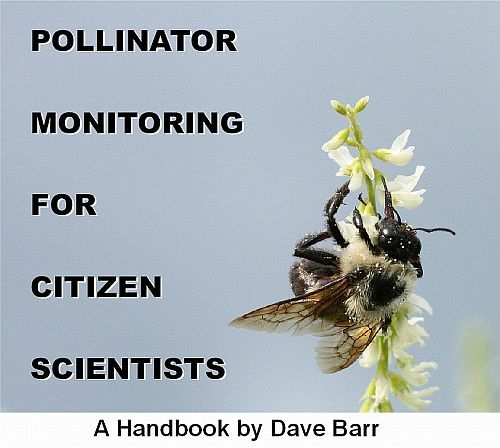 Many wasps are flower visitors, and thus pollinators. Although most of these flower-visiting species are predators, capturing arthropod prey to feed their larvae, the adults seem to require a regular diet of nectar to satisfy their energy requirements. Wasps in general don't have the multitude of branched hairs that make bees pollen magnets. But the frequency with which they visit flowers means they inevitably transfer some pollen as they go. At the Evergreen Brick Works many wasps can be seen on a variety of wildflowers. Earlier I wrote about the Great Golden Digger Wasp (Sphex ichneumoneus) visiting Virginia Mountain Mint. That spectacular species was seen frequently two years ago, but last year it was rare. 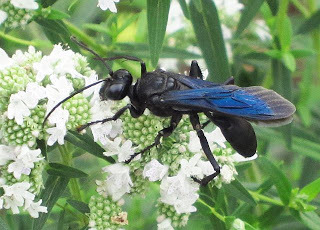 This year the Great Golden Digger Wasps are back, and they have been joined by a close relative, the Great Black Wasp (Sphex pensylvanicus). Both of these are large, an inch or more in length. In the Kaufman Field Guide to Insects of North America, Eric Eaton refers to them as 'regal.' The Great Black is probably the larger of the two. And as a dozen or more of them come and go among the flower heads, they are definitely the most noticeable.